One of the most satisfying things in my life is to share my love of light tackle fishing with someone who had either never tried it before or had no success. 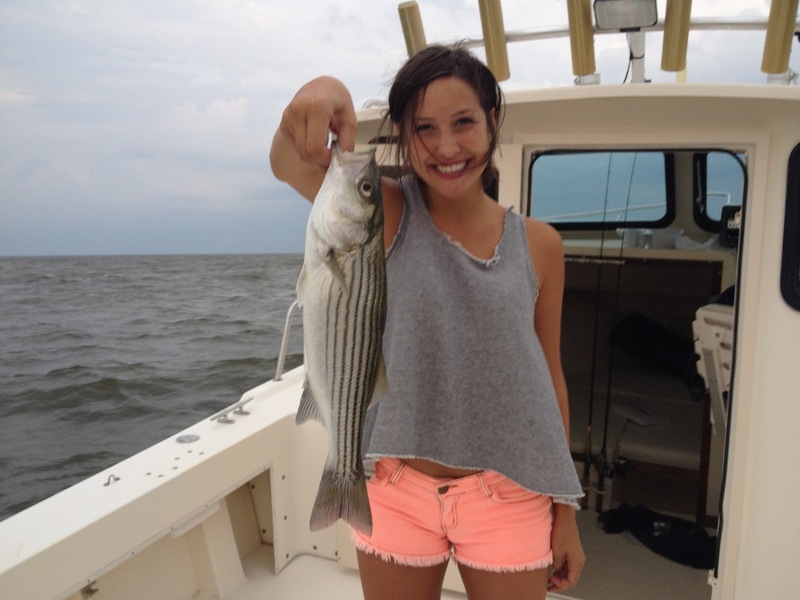 I had promised to abstain from posting until Mark, my daughter Grace's boyfriend, had landed his first striper. We had gone out more than a few times with no success. Despite the black cloud that hung over his head, he persevered and I could see that he was beginning to look at fishing in a different light. His only exposure to the sport had been "trolling" with his uncle. They had rarely caught fish and he felt bored. The difference with light tackle is that it is just you, a pole, and a fish. Fishing just feels less like "luck" and more like a skill that one can cherish for life. 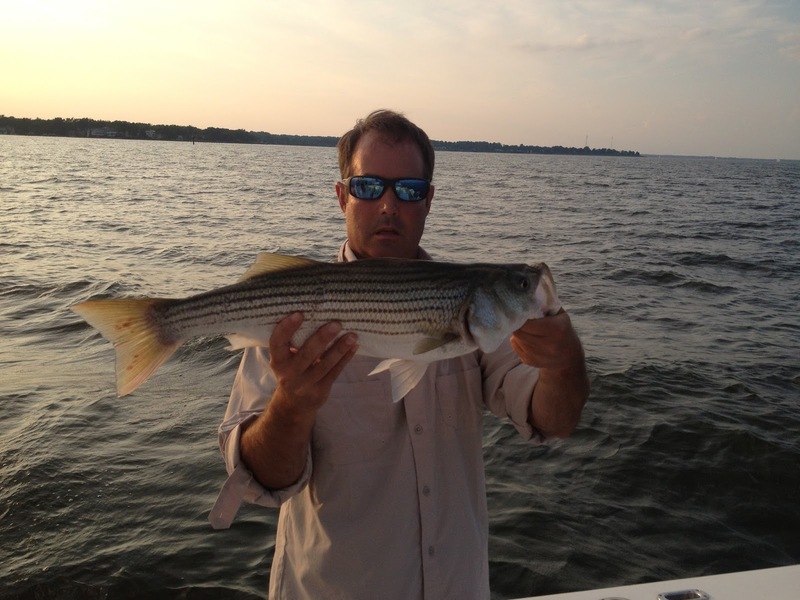 It was great to see Mark land his first fish this past week, and even more excited when he was inducted into Club Papa Dogg. I have little doubt we will be long time fishing buddies. This past weekend we had our extended family stay with us and I had a fantastic time fishing with some old fishing buddies and a few new ones. Saturday morning Danny and my brother in law Danny joined me for a quick half hour on the shoal. My brother in law had been out with me once before, but we were forced to fish the Riva road bridge area in early July which is a futile exercise. A strong outgoing tide and steady 10 knot wind made for some sloppy conditions, but it was quite pleasant. It was too choppy for topwater, so we were all armed with sassy shads. It was not long before my brother in law turned to me with a with a big grin and said "that was my first fish I have ever caught on a lure". Saturday night I was joined by Grace, Mark, and my sister in law Noelle. My sister in law is the consummate New York City girl. 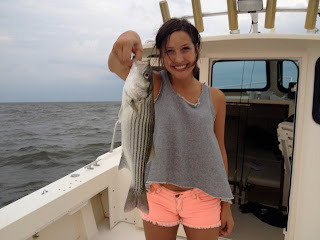 She does not own a car and did not recall ever fishing before. It was blowing about 15, so casting was a bit difficult. Nevertheless, she picked up the cast fairly quickly. We had less than a half hour until dark, so when I picked up my first dink, I handed her the rod. I could see she really wanted to get one on her own though. Unfortunately it was getting dark, so I made my way forward to pull the anchor. A determined Noelle had continued to furiously cast and just as I was making my way back I hear her scream that she had one on. 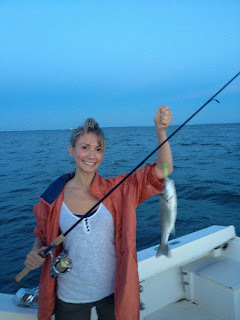 As she swung a beautiful 18 inch fish aboard, I could see on her face a true sense of pride and a new love for fishing. After the crew left, I was able to get back to fishing with my old fishing buddies. Dab's and I had a great night Monday with several 20-24 inch fish on Papa Dogg. Fishing has ben just plain amazing lately and should only get better as the fish start to put on some weight for the winter.